The California Wine Club: Save up to 66% and get $1 Shipping! The California Wine Club's last Wine Sale of the year is here, and it's a big one. First, let's get one thing perfectly clear about sulfites in wine: This is a natural process that's been used by winemakers for a couple of thousand years, with the benign purpose of keeping your wine from spoiling before you can drink it. With the limited exception of sulfite-sensitive asthmatics, who must avoid sausages, pickles and many other good things in addition to wine, most of us needn't worry about it. If you get a headache or a stuffy nose after drinking wine, you may be allergic to something - very likely the histamines in some red wines, or in the case of hangovers, simple over-indulgence. But it's not the sulfites. But the scary warning label, added to wine by government fiat as recently as the 1990s, prompts reactions that range from wary to hysterical among some wine consumers. So at least a few producers, not loath to latch on to a concept that sells, produce wines with no added sulfites. Note that word "added": Wine with zero sulfites is an unlikely thing, because they are a natural product of fermentation, naturally created when the wine is made. Accordingly, under new regulations for organic-wine labeling - featured in the July 24, 2009 30 Second Wine Advisor, Organic Labeling ... or not? - wine may be labeled "no sulfites" if the winery provides federal regulators an analysis from a certified laboratory showing "none detectable" at the parts per million level. The feds also must approve specific label art and wording in an effort to ensure that consumers aren't misled. Those regs now limit the unmodified word "organic" to wine made from organically grown grapes and containing no added sulfites. 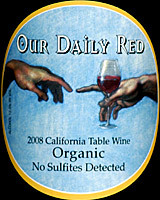 So say hello to Nevada County Wine Guild's "Our Daily Red" California Table Wine, which in the 2008 edition meets these strict standards. It's labeled "Organic No Sulfites Detected," "Certified Organic by California Certified Organic Farmers," bears the "USDA/Organic logo" and, in a burst of healthy enthusiasm, adds "Vegan friendly," apparently a guarantee that no animal products (including egg whites) were used in making the wine. I've been dubious about un-sulfited wines because of the apparent risk of bacterial contamination in wines intentionally made without preservatives. Our Daily Red counters, though, with a sturdy metal screw cap, which to its credit creates a more sterile environment in the bottle than the traditional natural cork. This wine, reviewed below, tasted fresh and clean, with no early signs of deterioration. The California Wine Club's last Wine Sale of the year is here, and it's a big one! You'll save up to 66% off normal retail prices PLUS every case ships for just $1. Choose from hundreds of award-winning, limited production wines from the best of California's artisan wineries. Visit www.cawineclub.com or call 1-800-777-4443. Half, full and mixed cases are okay. The sale ends Sept. 30, 2009, but order early for the best selection. Since 1990 The California Wine Club has introduced wine lovers to limited-production wines from real, working wineries. Every wine featured is guaranteed and there is never any bulk, closeout or private label wines. FOOD MATCH: The wine is billed as "vegan friendly," a reassurance to vegetarians and vegans that it was made with no contact with animal materials, including the egg whites often used for natural "fining" (clarification) in wines. Still, as a tart, fruity and earthy red, it's a natural match with carnivorous fare, and made a fine companion with an offbeat summer casserole of fresh tomatoes and onions with Cheddar cheese and a few chunks of Mingua beef jerky, a local artisan product, over Weisenberger Mill Kentucky grits.